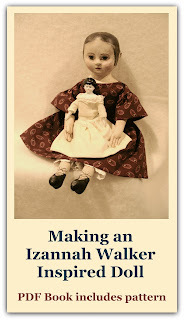 One of the Walker dolls that I've seen had what looked like surgical tape holding the boots and legs together. What I love about this is it's such a homemade patch job. No historically accurate repair here! Someone wrote the name "Perry" on the tape. Do you think that's the name of the doll or the name of the owner? 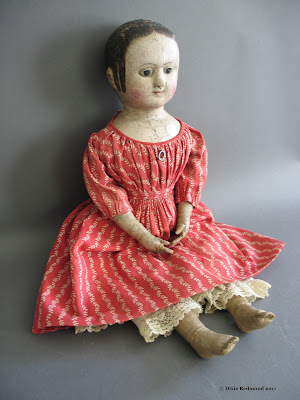 In any case, this is one of the charming things about old playthings - the way their owners have altered the doll over time. It reminds me of The Velveteen Rabbit. Funny you should mention this. 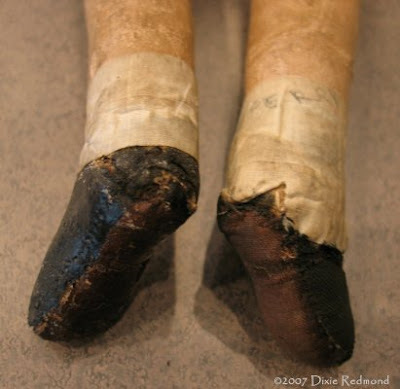 I was looking through your blog in an effort to trace the origins of an extremely battered doll of my grandmother's which just happens to be similarly taped, as well as patched with - at last count - 4 socks, 2 infant and one adult. There is almost no paint left on the head, and I wonder if you have any pictures or suggestions of pictures of I.W. dolls in states of advanced wear? And/or if you can tell me if cotton batting was the usual material inside the heads. I agree, that is what is wonderful about playthings. They are the only members of our family that live long enough to see 4 generations of us as children, and the means by which we keep them alive become as much the story as the dolls themselves. I'm hoping to keep this boy going for a few generations longer. I relish the idea of telling my neice, "And his nose was chewed off by your great grandmother!"